Researchers gathered to formulate recommendations for policymakers on the mitigation, adaptation and research priorities needed to avoid the catastrophic impact of ocean acidification on coastal economies. Ocean acidification is “one of the greatest scourges from the development of anthropogenic greenhouse gas emissions to have both concrete and global impact,” H.S.H Prince Albert of Monaco. The change in seawater chemistry caused by excess atmospheric CO absorbed by the ocean weakens coral reefs and slows their growth. A high CO2 ocean will affect marine organisms and the health of wider ecosystems, and has potentially huge consequences for coastal communities and their economies. 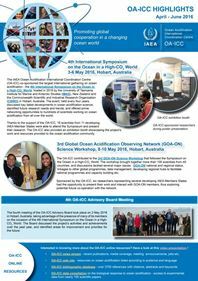 For researchers modelling the type and magnitude of ocean acidification impacts, for governments identifying policy interventions and for coastal communities seeking to maintain current economic activities and benefits, ocean acidification is a growing concern. This is where the Scientific Center of Monaco and the International Atomic Energy Agency (IAEA) stepped in to help. Since 2010, the Scientific Center of Monaco and the Environment Laboratories of the International Atomic Energy Agency have organized a series of workshops on “Bridging the Gap Between Ocean Acidification and Economic Valuation” in order to convene international expertise, consolidate the current state of knowledge and make recommendations for policy makers in response to ocean acidification. On 12-14 January 2015, 53 experts from 20 countries were invited on the occasion of the Third International Workshop to work on the potential effects of ocean acidification on different coastal communities and what could be done about it. I was one of them. The recommendations we came up with provide policymakers, managers and communities with natural and social sciences information to generate approaches to support sustainable development, while also seeking to reduce both the source and impacts of ocean acidification. 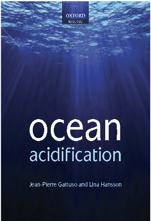 Modelling as a tool to evaluate bio-socio-economic on impacts of ocean acidification. Potential measures to tackle ocean acidification including societal action and adaptation, better governance and legislation options. In multi-disciplinary working groups we discussed the impact of ocean acidification on fisheries, tourism, trade, marine business and traditional culture, along with potential adaptation and capacity-building policy responses for these sectors and governments. We considered ways to model the cascade of potential impacts of ocean acidification on human activities. We focused on pathways of impact and possible adaptations through social transformation in the context of the UN Sustainable Development Goals. As a socio-economist specialist of fisheries and aquaculture issues, I contributed specifically to the discussions of the working group on coastal communities dependent who depend on the ocean for their livelihoods, and for whom ocean acidification is a growing threat. Our discussions focused on assessing the vulnerability of different countries and areas to ocean acidification. Factors such as habitat, resource and culture were taken into account and considered alongside the potential for adaptation strategies. Effective community responses to ocean acidification are likely to require an effective management of change, a process guided by long-term vision and leadership, to drive sustainable use practices, particularly when the benefits largely accrue outside short-term political cycles. • Fostering public and private investment in social, economic and environmental capital, particularly in communities and regions considered most vulnerable to the negative overall impacts of ocean acidification and other stressors, including in strengthening leadership and capacity in producer and community organisations. Cecile Brugere, 21 January 2019. Blog.